As part of his master plan for capturing the Hudson Valley General Burgoyne detached General Barry St Leger to invade the Mohawk Valley to divert American resources. 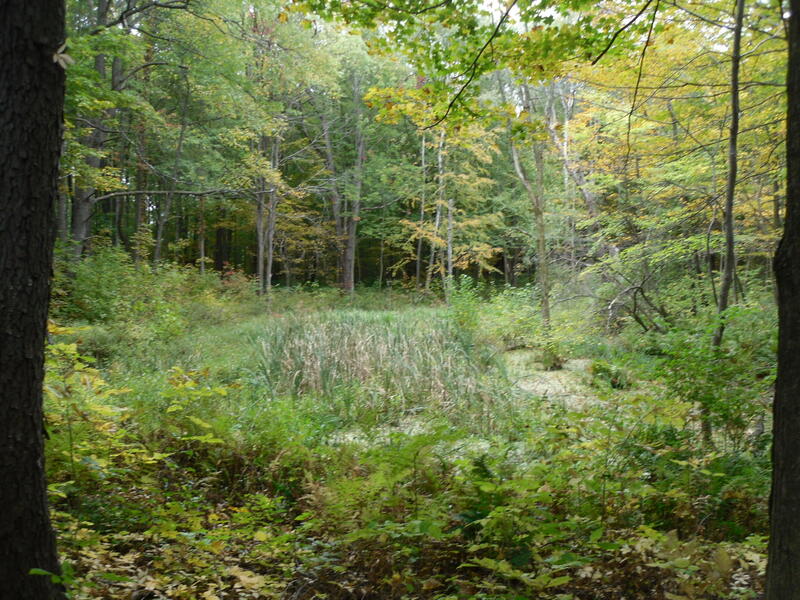 To secure this natural avenue, St Leger’s expedition aimed to capture Fort Stanwix (Renamed Schuyler by the Americans) which guarded the portage road between Wood Creek and the Mohawk River. He was joined by Sir John Johnson and his step Uncle Joseph Brant with 1,000 Iroquois and his own regiment of loyalists (Royal New York). Thinking it a ruin guarded by 60 men, when in fact it was newly rebuilt and had a Garrison of 550 men, Brant’s force advanced through Wood Creek as an advance guard to cut the fort off. Moving fast despite obstacles, terrain and enemy troops they managed a pace of 10 miles a day but arrived just too late to stop a supply column getting inside the Fort on August 2nd. Three days later on the 5th as St Leger was busy carving a supply road through the forest, building earthworks and having his sharpshooters start picking off stray colonials when he heard that a relief force, which had left Fort Dayton on the 4th would be upon him the next day. Marker at the battlefield, which somewhat over exaggerates the militia’s success, yet the long term results were undeniably successful for the rebels. Doug Kerr on Flikr. Hoping to avoid being trapped between two forces he organised an ambush. 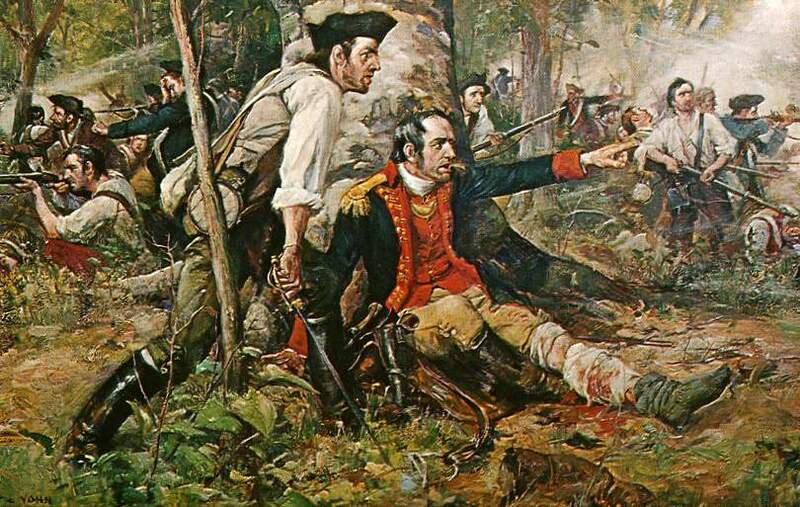 St Leger sent Johnson and Brant with 150 Royal Yorks and some Hessian Jägers with 400 Indians of the Onondaga, Cayuga and Seneca with Brant’s own Mohawk band to attack the American force of 800 men of the Tyron County militia, mostly men of the Savoy/German community, that had camped at Stirling Creek eight miles from the fort. Just to stack what he thought was a rather dicey adventure in his favour (St Leger had some 2,000 loyalists in total) American General Herkimer sent a messengers to Col Peter Gansevoort (Commandant at Stanwix) asking him to make a sortie, receipt of the order was to be three cannon shots. 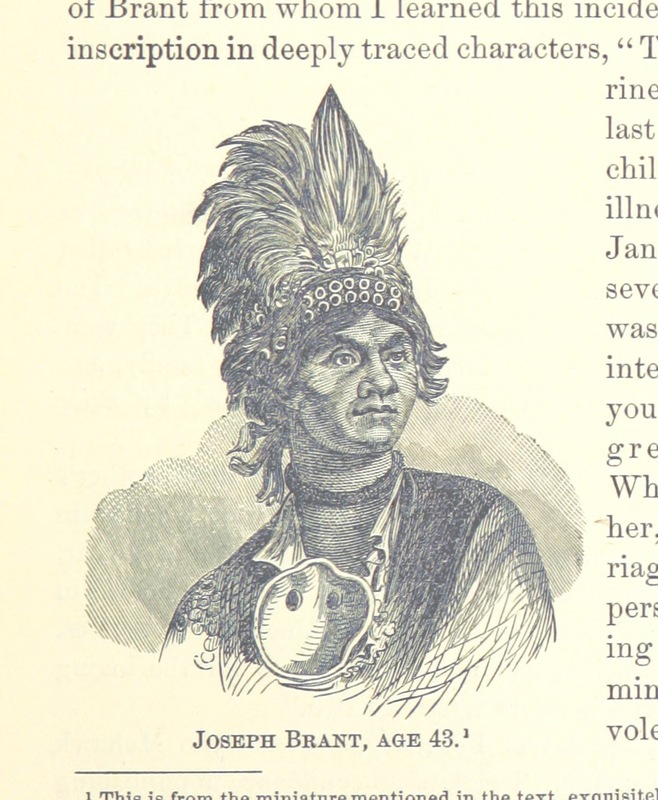 A rather unflattering engraving of the famous painting of Joseph Brant. British Library Flikr. On the morning of the 6th Herkimer dawdled waiting for the sound of cannon fire, as he did 50 Rangers and 60 Oneida American allied Iroquois Warriors arrived. Herkimer’s four Colonels were suspicious of his delay and pointedly reminded him that he had at least one relative serving with St Leger’s forces. Stung, Herkimer petulantly ordered the advance. By 9:30AM his leading regiment was four miles from Fort Stanwix and the rest of his command strung out over a mile passing through a deep ravine 700ft wide and 50ft deep lying in the shade of thick woods of standing Hickory. A corduroy of logs had been laid over the bed of the depression to ease the passage of carts in wet weather. Landscape at Oriskany. Heavily wooded and in parts boggy. Doug Kerr, Flikr. As the leading regiment began to file out of the ravine the trap was sprung. A shot cracked towards the middle of the column silencing the squirrel chatter, insect buzz and birdsong. No one knows which side fired it. Realising the game was up Johnson ordered the attack and three sharp blasts on a steel whistle shattering the silence. Then the shooting really started. Green coated Royal Yorks and Hessians rose from the undergrowth and dead ground, blocking the road and flanking the column on both sides. They let off a boiling discharge of musketry at close range into the belly of the ravine. Amidst the falling bodies of their comrades the advance guard was sent diving for cover and were thrown into confusion, gunfire was soon crackling down each side of the column like wildfire blown by the wind. Fifty year old General Herkimer conspicuously mounted was an obvious target, almost immediately his poor horse took a death injury from a musket ball in the side, the ball exited its other flank and broke Herkimer’s leg. The dying animal reared and fell, the General was unable to get free and was trapped beneath it. In the centre the militia column was suddenly assailed by the “Tory” rangers and Iroquois who had been hiding in cover on the high sides of the ravine, filling the forest with the sound of their war whoops. Wounded General Herkimer conducts the defence. Visscher’s regiment, the rearguard of the column, had been delayed by the slow movement of the baggage train of Ox carts, and were marching in single file. 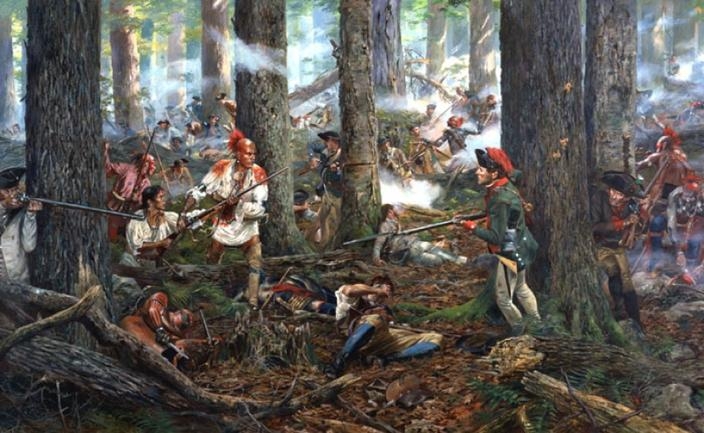 It had just entering the ravine when the Iroquois of Brant’s Mohawk band heard the signal to attack and appeared from behind the trees, unloading their muskets into the “Patriot” militia at point blank range. The militia were broken and began to run, helped on their way by the exultant warriors. 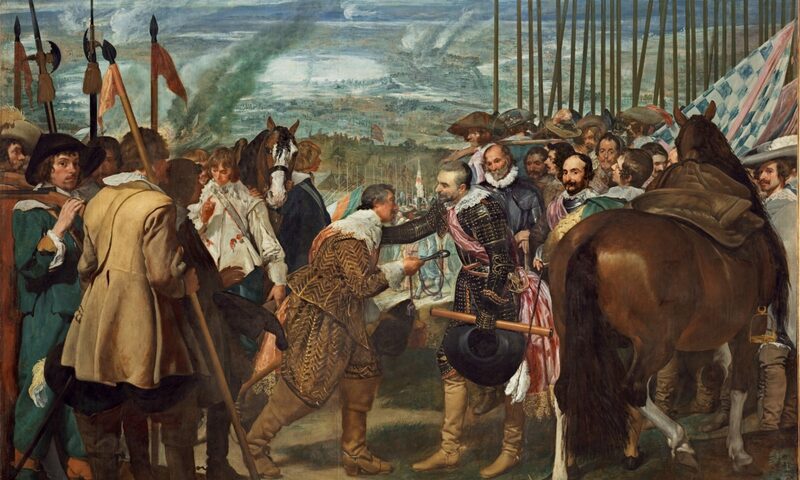 But the mohawks had attacked too soon and pursued their running enemy eastwards, and though Visscher’s regiment ceased to exist as a unit, the cap was off the bottle. While the Sun Tzu is all well and good for modern business executives, it wasn’t what John Johnson had in mind. 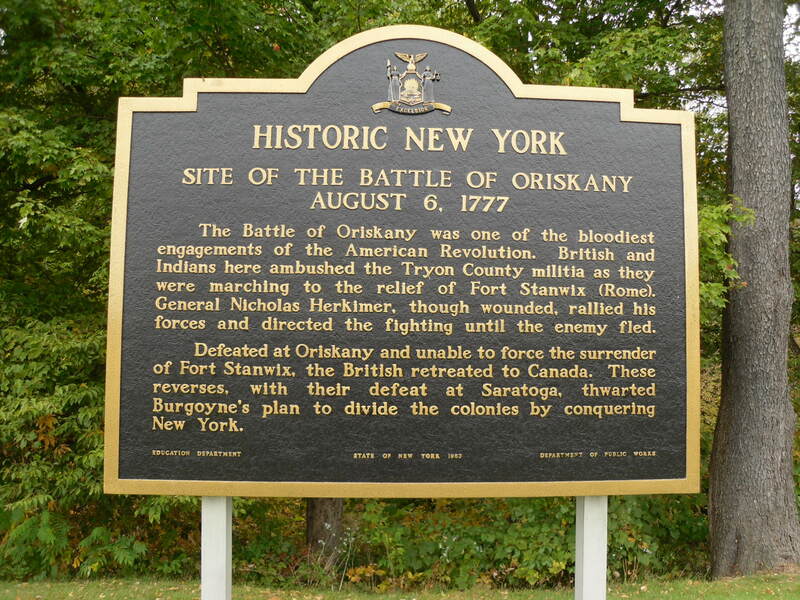 The Oneida at Oriskany by Don Troiani. 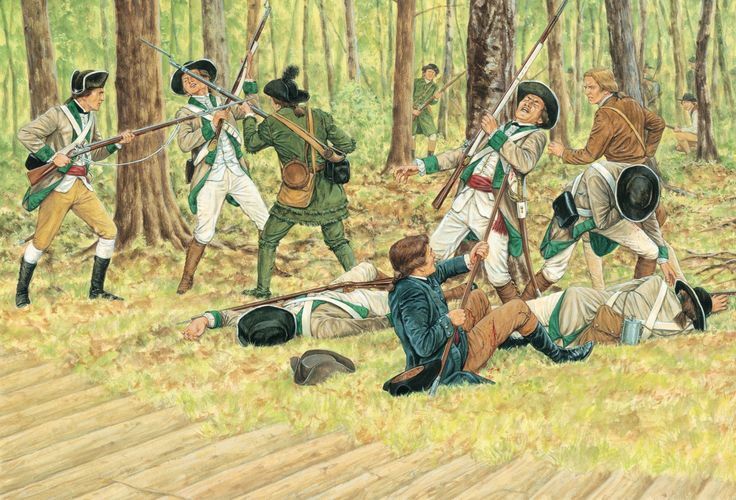 After the initial confusion the American Militia desperately fought their way back to higher ground in smaller groups, dragging General Herkimer along. Once in safety the General managed to organise a defence just in time to meet a Tory and Hessian Bayonet charge as the fight developed into a desperate hand to hand struggle. War chief’s of the Oneida, Honyery Tewahangaraghkan (He who takes up the snowshoe) & Henry Cornelius Haunnagwsuke lead their men into the forest to take the fight to the enemy and engaged fellow Iroquois and white allies alike in the traditional manner. Warriors such as Blatcop being particularly prominent in the hit and run fighting. The American Revolution was now a double civil war. Tewahangaraghkan, a powerful man killed 9 enemy warriors with the help of his wife Senegena (two kettles together) who reloaded his fusil for him. He fought with musket and tomahawk until his wrist was broken by an enemy ball. In those moments it seemed that the teachings of Deganawidah had been forgotten, split in two by the affairs of the white men, the Great League of Peace and Power, known as the Iroquois Confederacy, built on the unity of its members, died in the woods at Oriskany. Softly at first, the Great Spirit Wept. 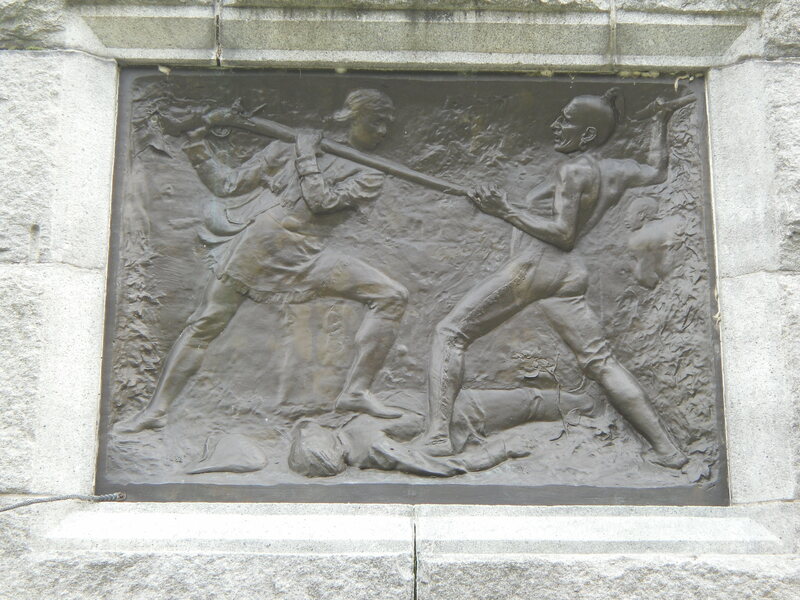 A carving on the monument at Oriskany showing the idealised American militiaman victorious over his native foes. Doug Kerr, Flikr. Unnoticed during the ferocious fighting, the sky had begun to darken with brooding grey clouds. At 11.00 AM a roll of thunder added its deep moan of anguish to the battle, and minutes later the first large drops of warm summer rain began pattering on the forest floor. The moist muggy atmosphere, unnoticed by the combatants, broke as the thunderstorm rolled overhead, and doused both sides in a soaking downpour. It must have seemed as if nature was asking for the madness to stop. For a while it worked, unable to keep fighting without ruining their powder, the shooting petered out and subsided. The two sides drew back from each other and waited. For an hour the storm poured down on the men waiting below. Each one hunched over his powder bag and musket lock, waiting for it to pass so they could get on with the killing. When it did subside at about 12:00 AM the fragrance of the earth was not allowed to linger, at that moment it was felt that gunpowder was a more attractive smell. As both sides waited tensely for the next move, the militia saw a body of troops marching down the road from Fort Stanwix. Taking them for Continentals coming to the rescue the Militia let them get close, but when one of Vissicher’s men went out to greet them and acquaint them with the situation he was promptly placed under guard. The ruse was uncovered by Captain Gardenier who after getting a tad to close, perceived that they were loyalists with their green jackets turned inside out and ordered his comrades to open fire. This signalled an all out assault on the American positions, the attack was conducted at a murderously close range and then spread out into in hand to hand fighting which boiled down to a series of localised skirmishes, until at last the three hoped for cannon shots were heard from the fort. Soon the Loyalists and Indians found out that their camp was under attack and broke off the fight that afternoon, having lost 150 men. The Americans retreated back to Fort Dayton with only 150 men unwounded from his three leading regiments, Visscher’s losses went dubiously unrecorded, Herkimer died soon after from a bad amputation of his leg. The Loyalists are rumbled by Adam Hook, Osprey. The ambush had not gone to plan but the results had been sufficiently acceptable. The American relief force had been turned back with heavy casualties. St Leger may have had a chance of taking Stanwix however the Indians had lost their blankets and cooking utensils in the American raid and had also lost many men for what they saw as little gain, the niceties of European strategy being pointless to them. Any fool could fight over dirt and get their enemy to run away, but what good was it if you didn’t get anything out of it? What did the ordinary warrior really care about whether a white man called himself British or American? Deciding that it was time to throw in their chips, they called it a day, taking what they needed for the journey home from the British camp. When they left St Leger lost the largest part of his force and abandoned the siege before more American reinforcements arrived. With the failure of the Mohawk campaign yet another part of Burgoyne’s master plan of 1777 went wrong and sent him on the road to Saratoga. Rebels and Redcoats Hugo Bicheno. Redcoats and Rebels Christopher Hibbert. Crucible of War. Fred Anderson. Tribes of the Iroquois Confederacy. Michael Johnson. A few Bloody Noses: Robert Harvey. Uniforms of the American Revolution. We tell this story in Drums Along the Mohawk Outdoor Drama in Mohawk, NY See http://www.facebook.com/drumsalongthemohawk for more information. The historical plaque paints a completely misleading view of the battle. It was far from an American victory. In fact, the battle was a rout and complete defeat of the American forces by the Loyalist/Indian forces. American historians and writers seem to have a hard time acknowledging this fact. They never want to admit defeat. This is true for some other American defeats of the Revolution as reported by American writers. My ancestor was an American Captain killed at this battle. Previous PostPrevious Sabres and Smoke: The War of 1812. Next PostNext Book Review: Napoleon in America by Shannon Selin.